Thank you Cuddlebuggery for sending me this copy! One of these days I am going to read the beginning of a contemporary novel then predict how the romance builds-up. Chances are, I’m going to get a gold star. Now that I’ve become more attentive about the contemporary genre, I am starting to realise that the romance is pretty much the same. While the complications may be different, it’s the same stereotypes and same ending. 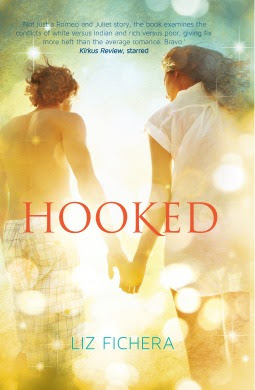 While Hooked was no exception, I did enjoy the plot and depth this novel expanded towards. We have the world’s greatest twist at the beginning. Meet Fred Oday, she’s a girl. *gasps all around* But it was a difficulty for me to wrap my head around it for the first few chapters, eventually, the name stuck with me like glue. When Fred replaces a rich white boy in the school boys golf team, she realises that she is in a lot of trouble. From the sardonic remarks and teases, Fred attempts to adjust with the unfortunate events- anything to let herself play golf. However it doesn’t help that she’s a girl, or that she’s a native American. What really concerned me about Hooked were the characters. They were so mediocrely typical. Not that they were disastrous in terms of personality but they certainly were not agreeable. Fred is a rather irritating character- she’s constantly second guessing herself and tends to block out conversations when she feels like it. Her complexion definitely leans towards sensitive and annoying. Then we have Ryan. He’s got ego of a trite quarter-back player. Except he undergoes some minor character development which was nice for a change. I guess what scares me most is that the characters are insignificant therefore, like some people have mentioned, are forgettable and dismissing. The romance was something I preferred than the characters. While I couldn’t connect truly and wholly towards the love interests, I was fascinated by the chemistry and endurance that lingered throughout. There are a few bumpy cracks along the ride that sung cliché but the bulk lay towards entertaining. Another aspect that I enjoyed- in fact my ultimately preferred quality of Hooked had to be it’s deeper meanings and plot line. It’s rare to find such topics of racism and poor and rich incorporated in a seemingly light summer read. Fichera’s skills by not making the racism coming out forced and rude was admirable. However, the racism layer fell short of a but as we did not get to know a lot of Fred’s heritage. Nevertheless, the rich and poor comparison was effective and sometimes touching. The plot of this contemporary was like no other. We have our wonderful golf matches which also have a hidden meaning of patronising condensation- which can be linked back to racism. Throughout, I was adoring Fichera’s plot and how the multiple morals leaked in between. Thanks, Melissa! It defintely has it sweet moments but has many deep meanings embedded throughtout. This book is pretty much the average length for me but the US cover was off putting. I like the UK-AUS way better. Hope you end up satisfied! I’m not the biggest contemporary fan out there, so when I do read contemp novels, the one thing I can’t stand is dull characters. Because characters are what essentially drives these novels, I always love seeing deep, rich, and un-stereotypical characters. So it’s pretty disappointing that both characters are dull. Although it IS nice that Ryan goes through some minor development! And the plot actually seems pretty good. And LOL at the plot twist that Fred is a girl, bahaha. I’m liking the sound of this slight depth regarding racism in this book- I really wish that was discussed more in YA, actually. Same here! But I guess this was one of the rare cases when I didn’t awfully mind the characters for the plot was insanely good for a contemp. Good to hear you agreed! No worries. Can’t wait to hear what you think if you end up reading this, Evie!